Didier Yves Drogba Tebily, international soccer star, was born March 11, 1978 in Abidjan, Cote d’Ivoire (Ivory Coast). His early childhood was spent in poverty. In an attempt to improve their son’s life, Didier’s parents sent him to France when he was just 5 years old to live with his uncle Michel Goba, an international soccer player also from the Ivory Coast. After a short three year stint in France, Didier returned to the Ivory Coast to live with his parents. But his stay would be short lived due to struggles at home. Both his parents had lost their jobs, so once again to escape poverty Didier moved to France to live with his uncle in the suburbs of Paris in 1991. In 1993 his parents followed Didier to France allowing the 15 year old to reunite with his family.The traveling over much of the course of his youth was difficult on Didier, but his hard times would become easier with the assistance of soccer. At 17, Drogba signed his first professional contract with Levallois SC, a local club team in the northwestern suburbs of Paris. After two years with Levallois SC he signed with Le Mans in 1998 and spent four years sharpening his soccer skills. Once again Didier singed a new deal, this time with Guingamp and played just one season with club. Drogba finally realized his dreams of playing big-time soccer with a move to Marseille, one of the most renowned soccer clubs in France. His outstanding 2003-2004 season performance at Marseille would prove to be the performance necessary to propel him to the highest levels of soccer in the world. Scoring 18 goals in 35 appearances marked him as the top performer in the French Ligue 1. His outstanding scoring accomplishment during the season caught the attention of English soccer power house Chelsea FC. 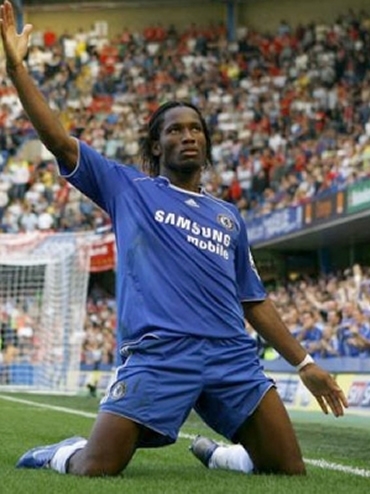 Following his year at Marseille, Drogba signed with Chelsea for a record £23.8 million Euros. Drogba has been one of the most admired players in the English Premier League (EPL) since his arrival at Chelsea FC for the 2004-2005 season. His play helped lead Chelsea to the 2004-2005 and 2005-2006 EPL League Championship, 2005 FA Community Shield title, 2005 and 2007 Football League Cup, and the 2007 FA Cup. He also earned personal honors as the top goal scorer in the EPL during the 2006-2007 season with 33 goals in 59 matches. In addition, Drogba also earned the coveted African Footballer of the Year award during this season. Didier Drogba is one of the main components to the Ivory Coast’s international soccer success. In February 2006, Drogba captained his country’s team to their second African Cup of Nations title and later that year he helped lead them to their first World Cup appearance. Finally with a stable home at Stamford Bridge, Drogba will attempt to lead Chelsea back to the top of the EPL as well as once again help the Ivory Coast to their second World Cup in South Africa in 2010. John McShane, Didier Drogba: Portrait of a Hero (London: John Blake, 2007), http://www.didierdrogba.com.